15th EAN Workshop on "Improving ALARA Culture through Education and Training"
Improving ALARA Culture through Education and Training"
Previous EAN and EUTERP workshops have noted the importance of delivering effective radiation protection education and training to workers and other stakeholders. Consequently, this joint EAN-EUTERP workshop considers how education and training programmes can be delivered effectively, to improve radiation protection in practice and disseminate ALARA culture. Tools to improve the effectiveness of training: new methods of delivery, blended learning and post-training interaction. How to measure the effectiveness of training: post-training assessment, ALARA evaluation, etc. The workshop will be of interest to a variety of stakeholders including training providers, employers and employees’ representatives, regulatory bodies, RP networks, research and other organisations involved in radiation protection. The workshop will take place in Hotel Lone, in Rovinj, Croatia, starting on the 7th of May, 2014 and finishing on the 9th of May, 2014. A welcome reception will be held on the evening of the 6th of May, 2014. The registration fee will be 400 € and will include: welcome reception, workshop dinner, three lunches, two coffee breaks per day, transport to and from the workshop dinner, the excursion to Brijuni (Pula), and the usual workshop materials. Participants should register before 15th of April, 2014 via the workshop website. Hotel booking, at a special rate, is possible via the workshop website, for Hotel Lone and Hotel Eden. Authors wishing to provide oral or poster presentation are invited to send an abstract, by the 20th of January, 2014. 14th EAN Workshop on "ALARA in existing exposure situations"
"ALARA IN EXISTING EXPOSURE SITUATIONS"
The concept of “existing exposure situations” was introduced by ICRP in Publication No. 103 (2007), and is included in the revised European Basic Safety Standards Directive. It is defined as exposure situations that already exist when a decision on control has to be taken, such as those caused by natural background radiation and radioactive residues from past practices or events. Examples include radon in dwellings and buildings with public access, building materials and management of contaminated areas from past practices and post-accidents. Other situations such as exposure from cosmic rays and NORMs may also be included. Optimisation is the key radiation protection principle for existing exposure situations, although it is not always clear how to apply this in practice. Consequently, the aim of the 14th EAN workshop is to focus on how the ALARA principle can be applied to the whole range of existing exposure situations. The Workshop will consider the wider principles and strategies that might be adopted, as well as the specific methods for implementing ALARA in practice. This workshop will consist of presentations intended to highlight the main issues, and a significant part of the programme will be devoted to discussions within working groups. From these discussions, participants will be expected to produce recommendations on ALARA in existing exposure situations addressed to relevant local, national and international stakeholders. The 29th issue of the EAN Newsletter has now been published and can be read in the Newsletter section. You can also download it as a PDF document pdf ALARA Newsletter 29 . The 3rd International MELODI (Multidisciplinary European Low Dose Initiative) Workshop was held from 2nd to 4th of November 2011 in Rome (Italy). The workshop in particular offered to the attendants the great opportunity to be informed about the latest updates on the low dose research issues, and to participate in the MELODI Low Dose Research Platform. The 28th issue of the EAN Newsletter has now been published and can be read in the Newsletter section. You can also download it as a PDF document. 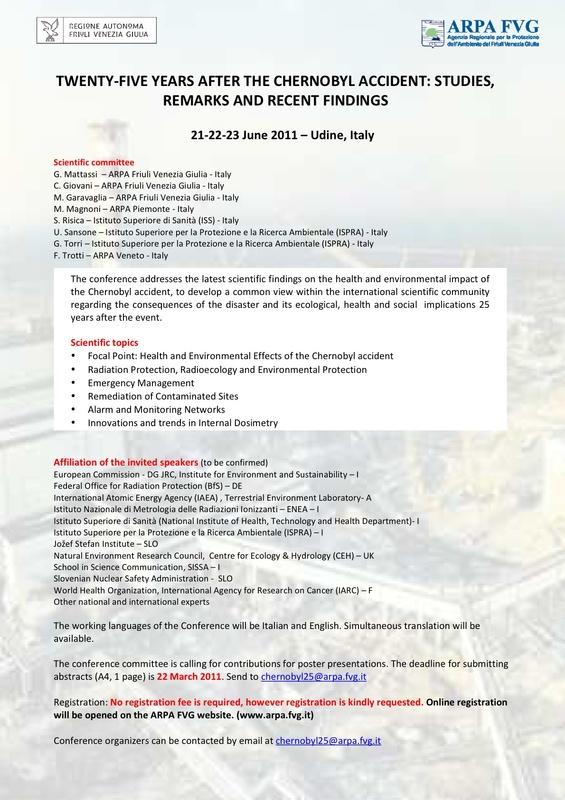 ARPA FVG (Agenzia Regionale per la Protezione dell'Ambiente del Friuli Venezia Giulia) is organizing from 21 to 23 June 2011 in Udine (Italy) the conference "25 years after the Chernobyl accident: studies, remarks and recent findings". This conference addresses the latest scientific findings on the health and environmental impacts of the Chernobyl accident, to develop a common view within the international scientific community regarding the consequences of the disaster and its ecological, health and social implication 25 years after the event. For more information, you can download the first announcement (pdf). For 1.5 years, the EAN Steering Group has worked on a 2010-2015 Strategic Plan for the network. This document describes the expected work of EAN during this period taking into account the future challenges for ALARA in Europe. For more information you can consult the webpage dedicated to the EAN Strategic Plan. You can also download the EAN Strategic Plan as a pdf document. 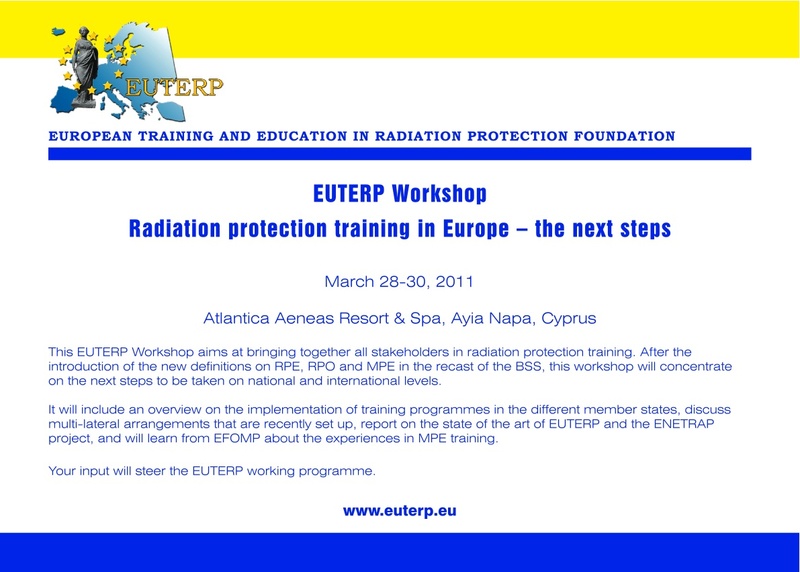 EUTERP Workshop - "Radiation protection training in Europe - the next steps"
EUTERP (European Training and Education in Radiation Protection Foundation) is organizing a Workshop on "Radiation protection training in Europe - the next steps". It will be held in Cyprus from 28th to 30th of March 2011. Information on the preliminary programme, registration procedures and the call for contribution can be found in the following website: www.sckcen.be/euterp_workshop.